being little • bristol uk fashion & lifestyle blog. : fashion for home giveaway! 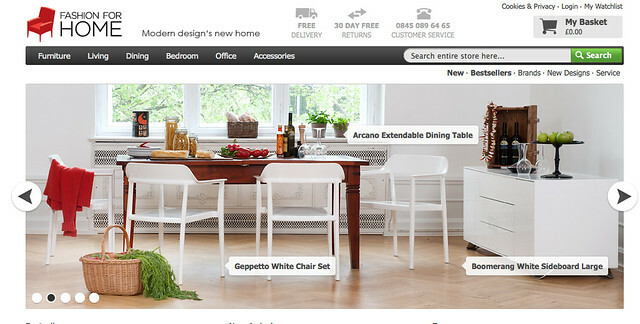 Fashion For Home is an online store selling high quality furniture and homeware. They have such a wide range of prices and products, from traditional to modern pieces, so there's something for everyone! Although I don't often blog about interiors, I love making somewhere my home with mismatched furniture and little bits and bobs. My tumblr is often filled with inspirational images of how I'd one day like my home to be! 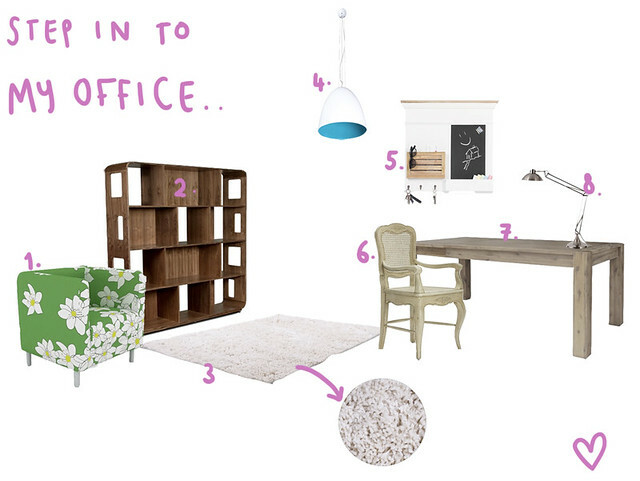 With this in mind, I thought I'd create a little dream office, with all items coming from Fashion For Home..
1. SOFAPOP CALTON ARMCHAIR WITH FLOWERS 1 COVER • 2. SWIFT WALNUT SHELVING UNIT • 3. NEBENUN BEIGE RUG • 4. META WHITE AND BLUE PENDANT LAMP • 5. MARINA MEMO BOARD • 6. POETIQUE ARMCHAIR • 7. HABANA DINING TABLE • 8. CANIS B SILVER DESK LAMP. I love this armchair, it's so cute and comes in loads of different fabrics. It'd be perfect for curling up next to a well-stocked bookshelf, with a cup of tea. Lots of lighting is key in an office, especially if you do creative things. I like my lighting to be simple and functional. - follow Fashion For Home on twitter. This competition is open until Saturday 16th of June, when I will pick a winner at random! This is such a lovely giveaway! I'm a little bit obsessed with homewares at the moment as i'm putting the finishing touches to my room which i just redecorated! Ah this is just what I need for my new little flat! eek this is lovely! Thanks! Following. My Twitter name is abi_gray. I won the marina memo board from another blog. I love Fashion at Home but it's a bit too expensive for me. This is so cute, as is everything on their website. 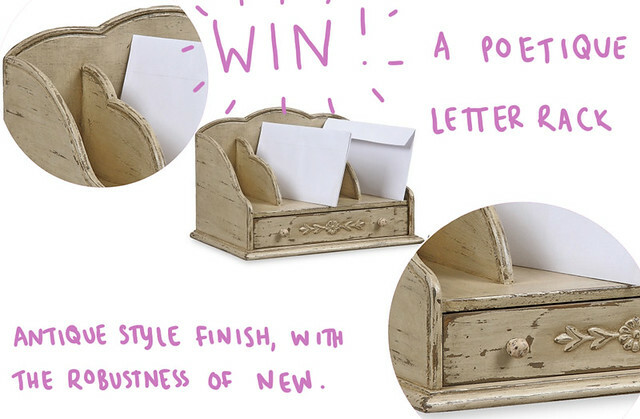 oooh I write lots of letters and postcards so this would be handy, very pretty. Followed! This is such a great giveaway Lyzi! beautiful shabby chic - it'd go with the rest of my furniture for sure! i am a follower on twitter (@ladiesinnavy). My email address is tashahinde@aol.com. I just moved into a new house and creating my little study area, this would be amazingly ideal, love it! I adore these antique looking letter racks! I'm about to move into a new flat & this would look gorgeous with the shabby chic theme we're going for :) Beautiful giveaway! Omg this would fit in so well in my room! I'm currently redecorating my bedroom at the moment and this is so incredibly beautiful. Were you walking around China Town (London) today? I saw someone who looked just like you with lilac hair. I automatically thought of you but wasn't too sure. Lovley prize, please enter me. such a gorgeous give away!! This is so pretty! I've been writing letters to my friends since I moved to a little village in the Lake District, so it would be a perfect little addition to my room. Ooh this would be perfect... I'm moving to a sparkly new flat in a week or so and I need pretty things to jazz up my new room with. Thanks for introducing me to the website- I know how I'll be spending my lazy Sunday afternoon now! I'm moving into a new flat in Falmouth in September and I think this would look really nice in it! That is beautiful!! The website makes me want everything!! Such a lovely giveaway!. I've been really into 'homeware' at the moment since signing up to Pinterest! That is so cute! I'd love to win it although I probably wouldn't use it for letters! That is so beautiful! It would look perfect in my office/sewing room! I would love the chance to win this. Ooohh would sit lovely in my newly set up work area, its gorgeous! Thanks for the opportunity!